The ordinations at Oakenholt in 1979 were held in a temporary sīma, created for that purpose inside one of the many wooden buildings at Oakenholt. In the morning of June 24th 1979, many famous monks were gathered. To the Mahāsi Sayādaw’s left is Venerable Ajahn Chah, behind his left shoulder is Ajahn Sucitto. Also in the front row of senior monks is Venerable Ñānadharo (from Laos), and Venerable Hammalawa Saddhātissa (Sri Lanka). The candidates are already in robes, awaiting the going-forth (pabbaja). 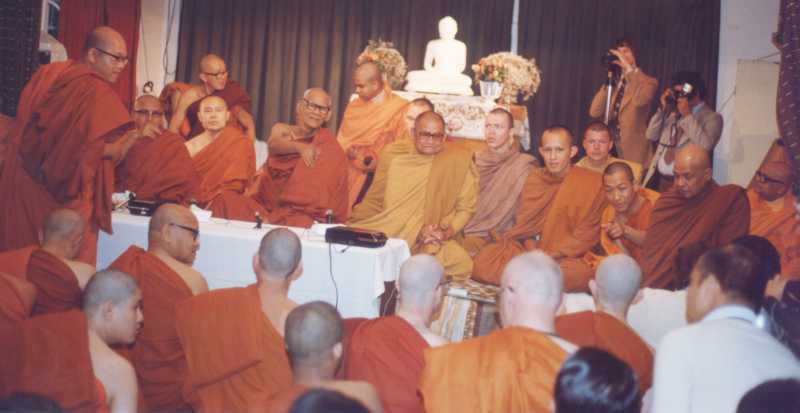 The Higher Ordination ceremony took place in the afternoon, by which time Venerable Ajahn Chah and his disciples had left for Chithurst monastery.